Khaled Abu Saleh (alt Abou, Salah) is a Homs-based opposition activist of the preaching variety, prominent in videos from Homs from later 2011 to about March 2012. Famous for being injured for the cause, and frequently treated by Al Jazeera as a reporter, he's also been exposed in apparent fakery repeatedly. 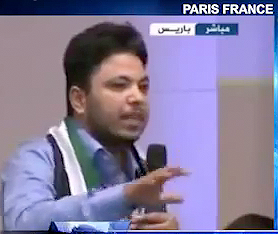 Later, he was invited to address the luminaries attending a "Friends of Syria" meeting in Paris in July. The following will seek to arrange his many exploits into a timeline (incomplete). Because he speaks in Arabic exclusively, we can only tell what he's saying when English subtitles are provided, which is usually. Khaled Abu Saleh on Al Jazeera testimony is very disturbing and heart breaking, he says a thug [Shabih] was captured in Homs & confessed to the following: Assad thugs captured 18 women from the city, kept in a farm in Al Mazra Area where they are raped daily and then killed one by one, 12 died and 8 of them left. Very wounded men showed, fairly comfortable in a field, perhaps as reward for the confessions. Dec. 24, Al Jazeera http://www.youtube.com/watch?v=37RDSBLl4_E dead man across the street. He points to the body repeatedly and shouts a lot. More gunshots happen, but he and the cameraman do not run for cover. HOMS: Khaled Abu Saleh and the observers in another new video. #Syria. They are discussing the attack in Bab Sbaa and the monitor is saying that throughout the attack on the infirmary, we were concerned about the safety of the residents if they would get hurt, and then a clash will happen._Khaled asked him: What about the people’s cooperation with you?_AL monitor: It’s not out of courtesy, but the residents were fully cooperating with us. Khaled mentioned the Iraqi female martyr and said that they,the activists, will take them to the location where she was killed. Jan. 15 (published): صمود الابطال شاهدوا شدة صبر ابوصلاح وهويلقي الشعر بعد استشهاداخيه Google-translated: "Steadfastness Champions viewed severity patience Abosslah and hair Hoagay after A_i_hadakhih" Cheerful talk among kindred spirits. 18+ Syria Dictator Kills Brother Of Activist Who Spoke With Arab League 1-15-12 Homs Babaamr. It must be so-Khaled is weeping uncontrollably while kneeling over a man's body on an orange stretcher. A family resemblance not at all obvious, but the resolution, lighting, and camerawork are all less than ideal. باباعمرو كلمة خالد أبو صلاح في جنازة أخيه 15-1-2012 Trans: "Babaamr word Khaled Abu Salah in his brother's funeral" Standing over his brother and some other dead men on similar orange stretchers, he's more composed, and holding a microphone. He gives a rousing, and presumably defiant, speech. Jan. 26 (published): خالد أبو صلاح يودع الشهيد البطل أسامة ادريس Google-translated: "Khaled Abu Salah filed hero martyr Osama Idriss," 0:48. Gently rubbing the face of a dead man and speaking to the camera, Khaled seems to have been crying recently. The army again shelled Homs, allegedly, in the early days of February, from the 2nd onwards, and especially the 5th. Terrible things were seen, and Abu Saleh was there to show it, to point at the gore, and to shout. One fairly famous video of the 5th shows him in the street, carrying the body of a little girl, aged about 4, with a mangled leg, face, and other injuries and torn/frayed clothing. This is all consistent with death from shelling (that is, flying pieces of home, caused by artillery, mortars, rockets, etc.). Calmly, he tells the camera and the world, presumably, what moral lesson to draw from her demise. He also on that day posed with two extremely injured but living pre-teen boys as props. (description and possibly links forthcoming). Syrian government has denied as baseless reports about shelling the central city of Homs at the hands of the Syrian military forces, the state-run news agency says. The government “denies shelling by the army in certain districts of Homs, as peddled by television stations that are inciting violence,” SANA news agency reported on Saturday [Feb. 4]. The denial came after Syrian foreign-backed opposition groups claimed that dozens of civilians have lost their lives in an attack by the army on the violence-hit city. Syria’s government, however, mentioned the attack on armed terrorist groups. “The civilians shown by satellite television stations are citizens who were kidnapped and killed by armed gunmen,” SANA said. To SANA's credit, at least the latter two victims lack signs that usually accompany shelling injuries - the coating of concrete dust, numerous random-seeming injuries rather than one huge one, and abrasions. However, the alternative explanations for what happened to those boys - crowbars, etc - are rather chilling to consider. Khaled was rushed to an opposition field clinic after his left hand was injured somehow (not clear yet, and no gore shown this time). It was definitely done by loyalists, as he tried to help their wounded victims. laid out, apparently unconscious, near those less fortunate. laid out but speaking In repose and sounding tired, with an IV tube taped to his right arm, Khaled says “I address an appeal for help, to every chivalrous man in this world to save our people in Bab Amr, to save the children and women in Bab Amr." Gunshot sounds, very nearby, start as he begins talking, but he’s unfazed, apparently used to the desperation. "O Lord, only you who can help us. O Muslims, I swear that almighty God will ask you about supporting us on the Judgment Day." wounded opposition activist Khaled Abu Saleh standing in front of flames and black smoke billowing from the bombed oil pipeline in the flashpoint city of Homs. Activists saying government forces bombed the pipeine from the air and the regime blames "terrorists" for the explosion which set it on fire. One video (no subtitles) and a different one with English subs show his defiant energy. (subtitles) When a brutal regime shed the blood of a rebellious population, trying to end their revolution, and turn their lives into hell they will become like this fire. … we will never surrender, even if your actions are darker than this cloud. We will never surrender. Here in Bab Amr we either win or die. Over the next two weeks, some would die, and many more would run away, leaving the government in control of Baba Amr (and some treasure trove of rebel video out-takes). Abu Saleh was famously seen Feb. 22 standing over the bodies of, as he says, Marie Colvin and Remy Ochlik, lying in a narrow entryway to a building. "They were killed by missile attacks on Bab Amr." He's still got the same hand bandage. The following day, he appeared in a video with their injured colleague Edith Bouvier and (Paul Conroy?) (about 5:00 in). April 10: A message from activist Khalid Abu-Salah on 10/4/2012 the deadline set by Kofi Anan Explosions and weapon fire happening very nearby, he's unafraid, pointing to a heavily damaged building, just now destroyed by government tanks and artillery. Left hand unseen. June 2 (published): Abu Saleh works quietly on his Macbook with both hands, while a friend pans between him and the plasma TV, showing "Sham" TV, with peaceful scenes of Syria and a national (not rebel) flag. It's not clear what this all means. Abu Saleh was revealed as a fabricator of propaganda by no later than March 1, with a video posted online: "Syria Al-Jazeera's Eye Witness Exposed" March 1 posting, April 1 (subtitles). Why exactly Khaled chose to do all this in front of a camera is not clear, but it's the same exact poor choice that fellow Homs-based "activist" Danny Dayem made, more famously, for exactly the same kind of effect for CNN, even down the 200+ claim, but in English. see video here. Further Exposition (semi-organized): Infowars posted a useful list of rebel atrocity and fakery videos. Among these is Mr. Abu Saleh twice, in the Addounia report above, and another posted May 4 by SyrianGirlPartisan. Infowars description: "This clip shows a Syrian insurgent displaying his psychic abilities at pinpointing where a “bomb” will strike before it happens as he rants to the camera." This is an out-take or different version of the scene from April 10 mentioned above. By no later than this March 2 posting, Abu Saleh was exposed coaching children to pretend being injured, again on Addounia. 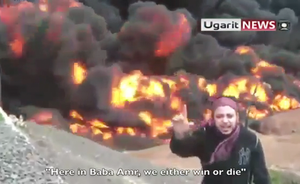 A different edit shows only the part where she explains things, as shared with Al Jazeera. The longer video with out-takes shows the heavily-bandaged little girl looking bored but healthy and in no discomfort aside from the masses of gauze. By the subtitles (can't be verified) the people talk to Al Jazeera, who advise ditching the tripod to make their camera look like a phone. Someone apparently in the background is asked "where were you wounded?" and responds "I'm not wounded." (by subtitles, it looks like the little girl says it, but it doesn't sound like that). People can be heard laughing at different points, including this one. Then at 7:30 in the video he reportedly tells her what to say. This isn't translated to English, but he seems to explain something earnestly, and she nods. Her veiled mother reportedly refuses again to speak, and Khaled dials a number into his phone, inspecting a nearby dead body as he waits. A critical compilation video in German: Aufgedeckt - Die Schauspieler von Syrien (Revealed - The actors of Syria). Published on Mar 31, 2012 by MrWotan77 (7:14) on-screen title: Khaled Abu Salah in Seiner Paraderolle als “Schwerverletzer” (trans: Khaled Abu Salah in his signature role as "gravely injured person") Compilation video that captures some of this, based on and including a German TV news report questioning Abu Saleh's credibility. The emphais on his being near death, and twice, seems unfounded. Only a left hand injury seems to be alleged, and both hospitalization videos were first posted February 6. This video implies the second was on around the 19th (perhaps citing a re-post). He calls for a No Fly Zone and a Buffer Zone although he tells the Conference that the Syrian people are making their own Buffer Zone by their own hands. He says the Friends of Syria needs to arm the opposition and that the UN will never do anything because of the Russian Veto and that the World should not allow the Russians to block help to the Syrian people. 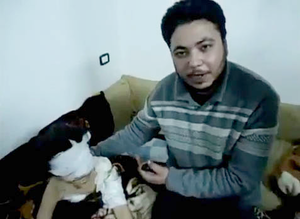 In December 2012, Khaled Abu Saleh reappears in a video uploaded Dec 18, interviewing NBC reporter Richard Engel. Engel's story of his alleged kidnapping by pro-government "Shabiha" had just hit the US media after he was purportedly freed after five days in their custody. Even though astute observers immediately pointed out the questionable nature of this story, it wasn't before April 2015 that NBC exposed at least a little bit about it, with Engel maintaining that he was "misled" about the pro-Assad background of his alleged kidnappers. In January 2014, a Baba Amr Press Office uploaded to YouTube an hour long interview Khaled Abu Saleh did with influential Islamist militia leader Zahran Alloush.